Shri S.C. Aggarwal, IAS, Chief Secretary, Punjab Launching "Fazilka Femto Ecocab"
Small town metro on rubber tyres. 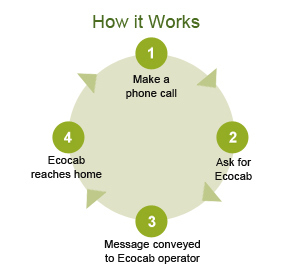 Ecocabs are basically cycle rickshaw service made available on phone call at door step through the network of call centres, similar to dial-a-cab/taxi service . It was introduced in order to bridge the gap between demand and supply need of para transit mode as a Public transport using latest transportation management and technological tools. Ecocabs were conceptualized with an idea to strengthen existing unorganized network of cycle rickshaw and to promote it as a affordable means of Sustainable Urban Transport for short distance travelling need. First time in the World, it was launched by the group of young entrepreneur at Fazilka, an Indian border city and district headquarter of Punjab. 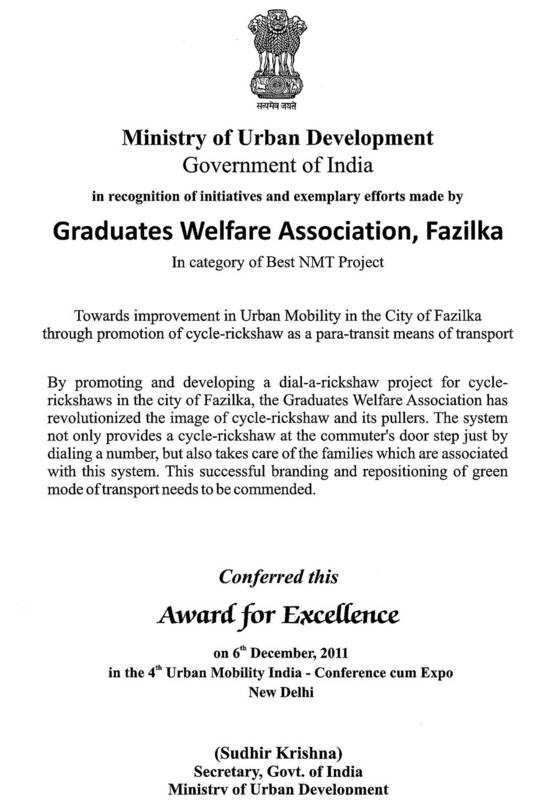 On 6th December 2011 project Fazilka Ecocabs was awarded with "National Award of Excellence" in the area of Non-Motor Transport(NMT) in India, by the Ministry of Urban Development, Governmental of India. "to organise and improve scientifically, the existing rickshaw operation using modern management tools and real time technologies for its promotion as sustainable para transit mode of public transportation as an alternative to car centric development and its linkage as a feeder unit to any mass rapid transit, for the benefit of traction men, society & environment and rickshaw at large to achieve the overall agenda of low carbon mobility"
"It gives me immense pleasure to learn that Graduates Welfare Association, Fazilka has initiated a dedicated web portal for the "Ecocabs". Traditional rickshaw has been an affordable means of transportation in India since over a century. Department of Tourism, Punjab has pioneered to introduce "Fazilka Ecocabs- a modified traditional rickshaw operations concept" in the holy city of Amritsar and also in the other parts of Punjab. In the era of technology, making "Ecocabs" information accessible and available through website is a welcoming step. This will benefit the concerned authorities, NGO's and public at large to learn more about the technical and implementation aspects of "Ecocabs". I on behalf of Department of Tourism, Govt. of Punjab wish them all success."